Make Your Mark on LA because on May 29th, Green Works is making one of Los Angeles’ grimiest alleys beautiful through the power of cleaning. You can enter for a chance to win a trip to L.A. with Green Works to help transform the alley into a reverse graffiti art piece. You will also receive a Coupon for $1 off just for watching the original Reverse Graffiti Project video. 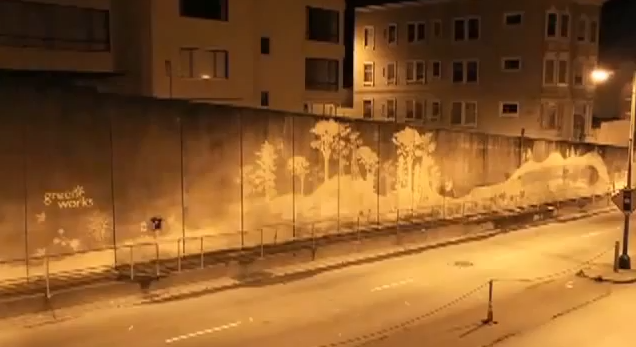 In case you don't know about The Reverse Graffiti Gallery, reverse graffiti or “clean tagging” is a method of creating art by removing dirt and grime from a filthy surface. This unique art form taps into the Green Works mantra that cleaning can be beautiful. For the Reverse Graffiti Gallery, Gorks set out to find a dirty place in L.A. that needed some love. After searching hundreds of blocks, Green Works found the perfect place. And on May 29th, Green Works will unveil the gallery of unique art made simply by cleaning with Green Works. But they're not working alone. They have found the perfect artist to partner with—a true pioneer of the reverse graffiti method. Together they're going to turn one grimy alley into an inviting and beautiful place for the community to enjoy. Prize Details: The winner of the grand prize will receive a three-day trip for two to Los Angeles to attend the Reverse Graffiti Gallery opening, a $1,000 gift card and access to some of the best art the city has to offer with day passes to select museums. While there, you can lend a hand in helping to create a reverse graffiti image with ork's artist that will appear as the final art piece in the Reverse Graffiti Gallery. Three additional entrants will also be selected at random to win Green Works products. Entry Details: Check out the Reverse Graffiti tab on the Green Works Facebook page to enter. Follow the links and instructions to complete and submit the registration to receive an entry into the Sweepstakes. Limit: You may enter one (1) time during the Promotion Period. Multiple entrants are not permitted to share the same email address. Check it out on Facebook and for full rules, follow the link: http://greenworks.herokuapp.com/includes/rules.html.